Yesterday marked the ten year anniversary of one of the saddest days in U.S. history, the September 11 terrorist attacks. It's hard to believe that ten years have passed. I remember getting ready for work Monday, September 11, 2001, stopping suddenly as I watched the Twin Towers collapse in smoke and fire on TV. I remember my eyes being glued to the screen. I remember speaking to close friends, just happy to have contact with those I loved. And I remember praying. But more memorable than the day itself is the aftermath that ensued. Life in the United States hasn’t been the same since the attacks, and life will never be the same. Here is a list of what I miss about our pre-9/11 world. Being able to walk loved ones up to their airport gates to say goodbye. The word “terrorist” being a nebulous term heard only when discussing distant countries, versus one I hear frequently at home. Knowing that my Indian, Pakistani, and other brown skinned friends can travel without the public fearing that they are terrorists. Being able to take a full tube of toothpaste through security. 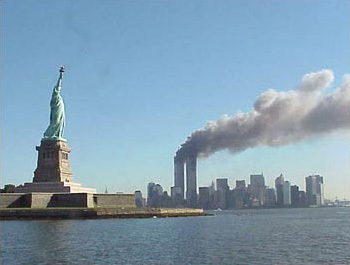 Having September 11 feel like every other day in September.